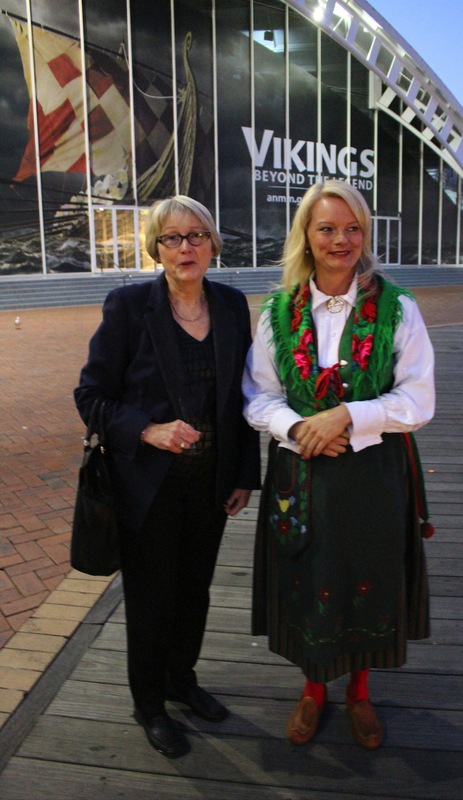 Australians love to travel, but one of the problems we experience is our geographic location where we are so far away from the history and culture of Europe. Unless you have at least three weeks for a holiday, it’s hardly worth sitting on a plane for almost 23 hours to travel half way round the world. Closer to home, if you want to experience a touch of the French lifestyle, New Caledonia is only 2½ hours flying time from Sydney. 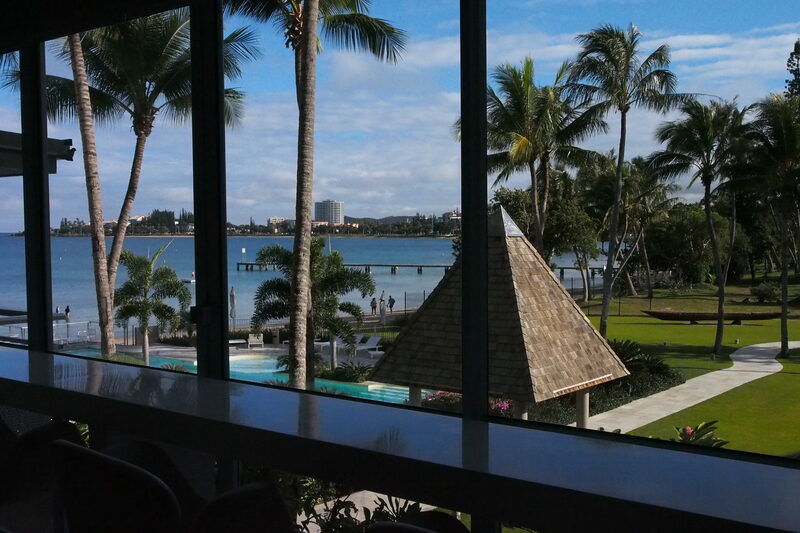 Aircalin offers daily flights to Noumea, leaving Sydney early afternoon, giving you plenty of time to pack in the morning then travel to the airport, without having to set the alarm clock for a pre-dawn wake up. Their Airbus A330-200 offers the latest in comfort. 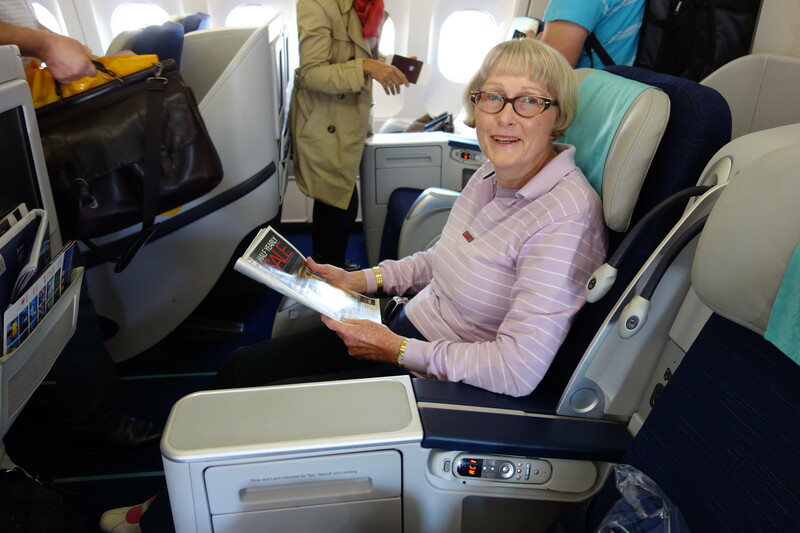 On a recent flight I decided to begin the holiday in style and travel Business Class, or Hibiscus Class as it is known on Aircalin. The French experience began the minute I boarded the plane, being welcomed by the charming crew whose English came with a tinge of their French accents, making you want to listen to every word they spoke. Once seated I was offered a glass (or two) of champagne, which really put me in the holiday mood. After departure, it wasn’t long before I was served my three course meal, which was actually delicious, accompanied by a choice of red or white wines and served with all the flair of a fine dining establishment. No problems about airline food on Aircalin. After finishing my coffee, I thought I’d get in a short snooze so I pressed a few buttons on the arm rest and my seat turned into a lie flat bed. Such comfort, I was sorry the flight was not longer. We stayed at the newly opened Chateau Royal Hotel, located on the beach at Anse Vata, set amidst tropical gardens and lawns. Our room, which was actually a two room suite, had a full length balcony that could be accessed from both rooms, and the sweeping views across the bay could be seen from almost every part of the room. There was also a fully equipped kitchen, perfect for those wanting to try their hand at cooking some of the local produce. Although the hotel is right on Anse Vata beach, there’s also a large swimming pool, surrounded by palm trees, ideal for relaxing in the sun. The hotel is also famous for their spa, providing massages and every sort of beauty treatment one would expect. 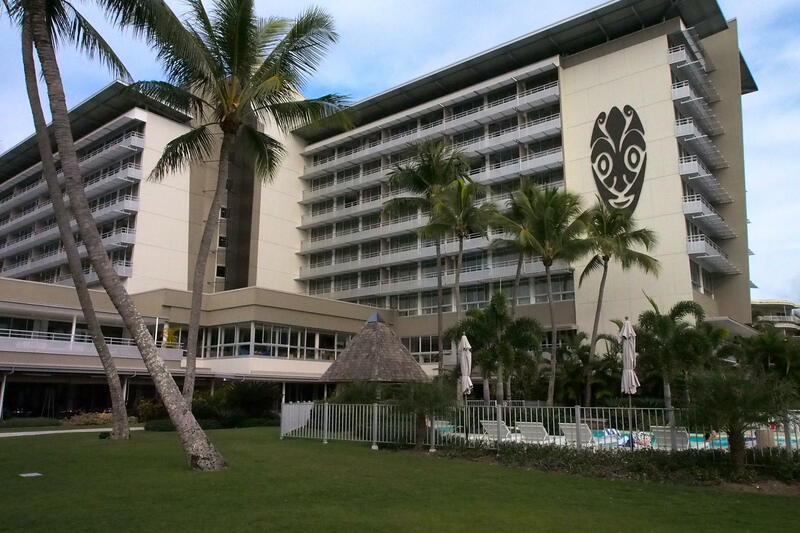 With several restaurants and bars, the hotel offers everything for a perfect stay. As a lover of a good martini, the title of Australian author Nicole Lenoir-Jourdan’s new novel caught my eye. Nicole’s latest work is a comedic science fiction tale in the genre of Jasper Fforde, Terry Pratchett and her favourite writer, the late Douglas Adams, whom Nicole was privileged to interview. Her most prized possession is her copy of the Douglas Adams’ Ultimate Hitchhikers Guide to the Galaxy which bear the words: “To Nicole, Whose questions were much more clever than my answers! With best wishes, Douglas Adams”, after she interviewed him in Sydney for the Peak Magazine (Singapore) and Oyster Magazine. Nicole’s first published work was a children’s cook book, “The Wonderful Wizard of Borneo’s Magic Recipe Spells” which was utilised by Malaysia Airlines and given away to children who flew on the airline. 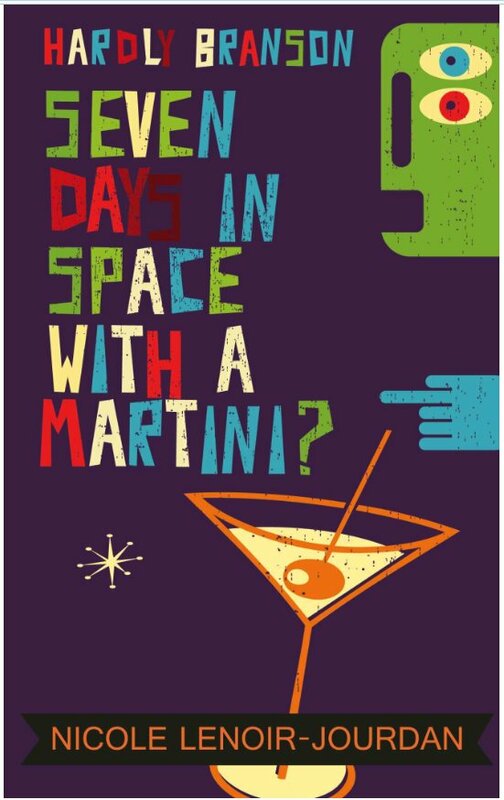 The Kindle version of “Hardly Branson: Seven Days in Space with a Martini” can be purchased on Amazon for $0.99. Sounds like a fun read over the Christmas and New Year holiday break. 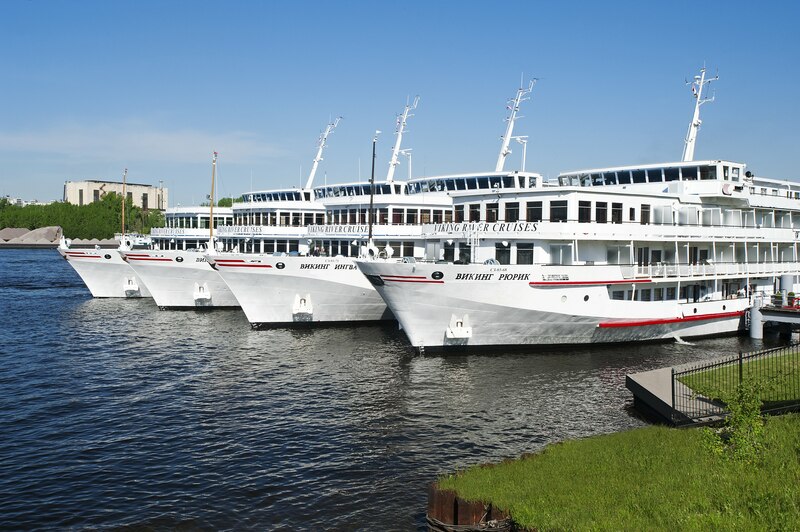 River cruising has grown at an average annual rate of approximately nine percent over the last few years and in March this year, Viking set a world record with the inauguration and simultaneous christening ceremony in Amsterdam of ten new Longships for the 2013 sailing season. Viking Longships layout allows for two Explorer Suites and seven two-room Veranda Suites with full size veranda in the living room and French balcony in the bedroom. The 39 Veranda Staterooms have full size verandas and there are 22 French Balcony Staterooms. All Longships have sustainability upgrades such as onboard solar panels and organic herb gardens. The energy efficient hybrid engines reduce vibrations, giving a very smooth ride. Since Viking’s 1997 inception, their fleet has grown to 35 river vessels, cruising along the rivers of Europe, Russia, Ukraine, China and Southeast Asia. Featuring included shore excursions and on board cultural enrichment, excellent dining choices with included wine, it is easy to see why river cruising with Viking attracts passengers. 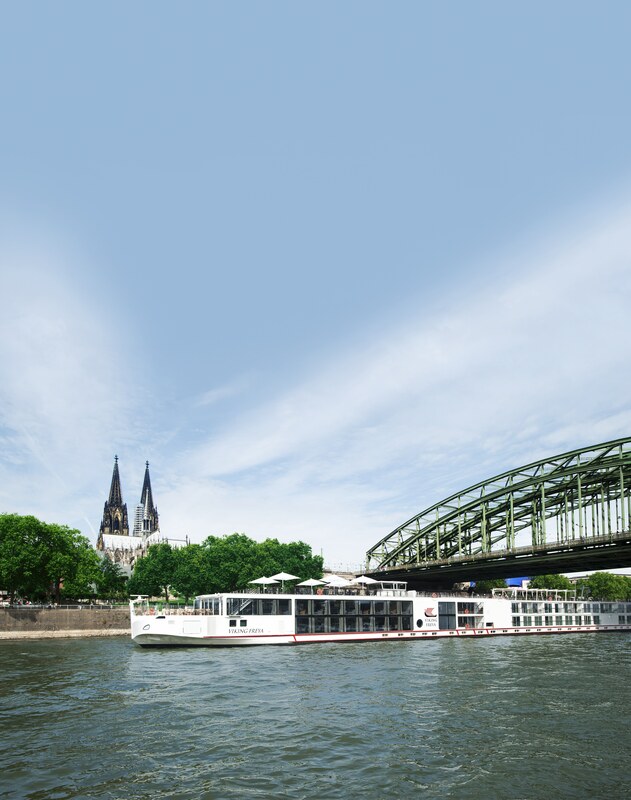 One of Viking’s most popular river cruises is the fifteen day Grand European Tour from Amsterdam to Budapest or return along the Rhine, Main and Danube Rivers. This cruise offers a variety of sights, from Holland’s windmills and tulip fields to Germany’s fairytale castles and the picturesque vineyards of Austria’s Wachau Valley. 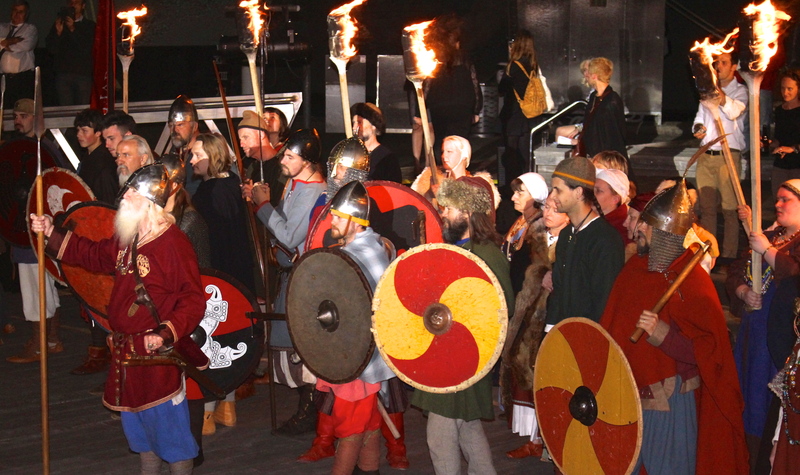 Viking Cruises is a major partner of the Australian National Maritime Museum’s upcoming exhibition “Vikings – Beyond the Legend” commencing on 19 September for a limited time. Located at Sydney’s Darling Harbour, this exhibition, direct from Sweden, will display a variety of treasures and reveal how the Vikings lived, going beyond the myth of Vikings as ferocious plunderers in horned helmets. 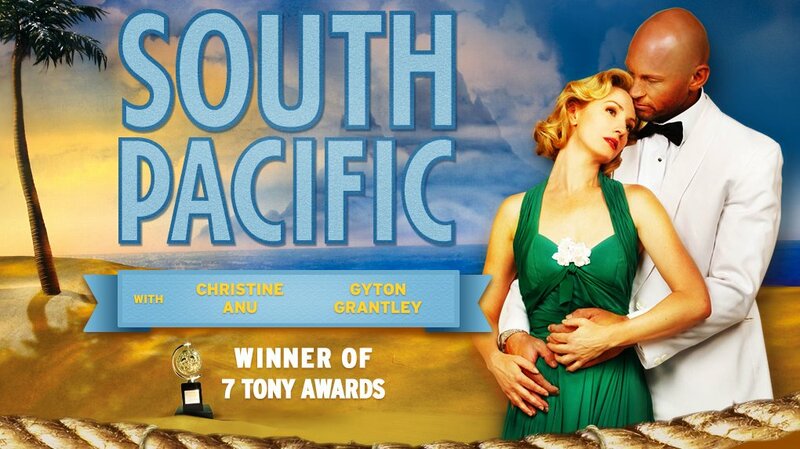 The Lincoln Centre Theater’s production of Rodgers and Hammerstein’s famous musical “South Pacific” has returned to the Joan Sutherland Theatre at the Sydney Opera House for a strictly limited second season and is sure to be as popular or even more so, as it was last year, playing to sell out crowds. The 34 piece orchestra makes Rodgers & Hammerstein’s well loved music and lyrics come alive. The fact that I knew every tune and all the words made the production even more enjoyable. Teddy Tahu Rhodes’ deep voice singing “Some Enchanted Evening” sets the mood as the story, involving the lives and loves of the US Navy sailors and nurses based in the Pacific during World War II, unfolds. Gyton Grantley is also well known to audiences for his TV roles, especially as Carl Williams in Underbelly. As Luther Billis, he has one of the show highlights, singing “There Is Nothin’ Like A Dame” along with the Seabees. Blake Bowden, the winner of the 2011 Rob Guest Endowment Award, provides another magic moment for the audience when, as Lieutenant Cable, he sings “Younger Than Springtime”. This is the first Rodgers & Hammerstein production that Opera Australia has presented and after enjoying this one so much, I hope OA will bring Australian audiences more from this incredible American duo. Whether you’re after a bargain, a one-of-a-kind piece or simply want to browse the treasure trove of items from times gone by, The Vintage & Retro Fair is a great day out, bringing together the best dealers in vintage, antique and retro clothing, fashion, accessories textiles, jewellery, homewares, furniture, home decor and collectables. The Vintage & Retro Fair offers plenty of variety, with the best dealers from each era catering for a unique and varied crowd. Antique hunters will love the older trinkets and collectables dating from over 100 years ago, vintage lovers will flock to the genuine curio from 1920s onwards and retro fans can search stalls filled with inspired and sourced pieces from the last 20 years. Browse through the couture clothing, ornate costume jewellery, hats, shoes, sunglasses, handbags, designer one-offs, menswear, posters, magazines, sewing patterns, fabrics, furniture, retro home decor, belts buckles and trinkets. There’s a display of classic cars to add to the feeling of stepping into the past. Johnny Welsh, who put on last year’s fantastic three night Elvis Cruise on board Royal Caribbean’s “Rhapsody Of The Seas”, where 15 Elvis tribute artists kept the passengers entertained night and day, brought Elvis back to Sydney for one day only. Sandra Tiltman with “Elvis”, Mark Andrew. 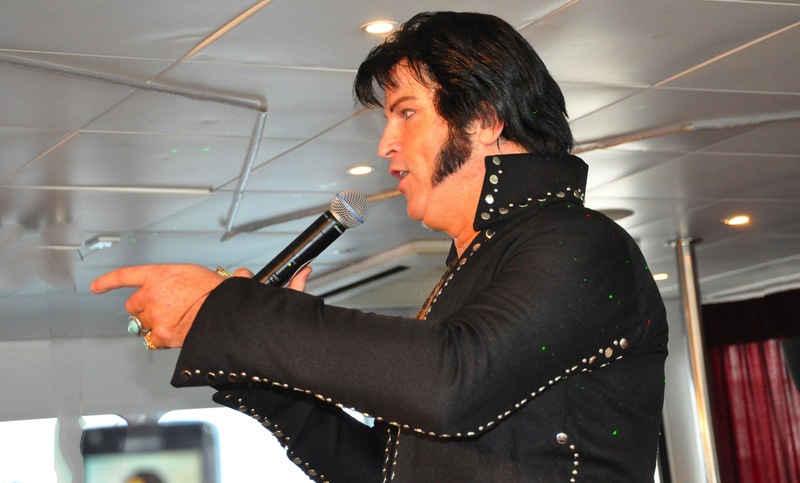 Recently Johnny Welsh’s Music Themes Australia organised a four hour cruise around Sydney Harbour, where fans were entertained by not one, but two Elvis tribute artists, Mark Andrew and Damian Mullin. During their performances, both artists gave us different versions of Elvis throughout his career, with their costume changes and song choices. 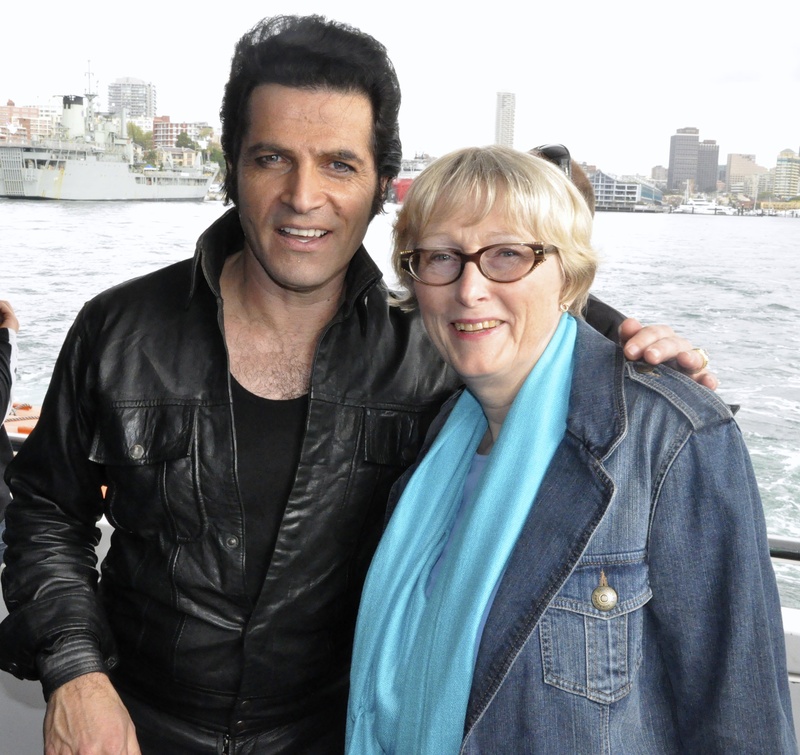 Fans of all ages enjoyed the afternoon cruise, which also included lunch, and will be sure to return for the next Elvis Sydney HarbourCruise on 3 November which will feature Pete Storm from the UK and Australia’s very own Allan Wright and Elias Jamhour. To book tickets, call Margot on 0418 166 436. You are currently browsing the SANDRATBLOG.COM blog archives for September, 2013.